bus tour of the County and potential development sites for GSA officials. the Council on Wednesday, March 14th. 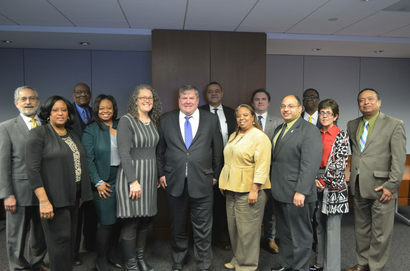 In our role as the County’s fiscal authority, the Council now begins a careful and deliberative review of the proposed FY 2019 County Budget, working with the Executive Branch, residents and all stakeholders to produce a final budget that strengthens our communities and reflects our shared priorities for job creation, quality education, affordable healthcare, safer communities and a thriving economy. In keeping with the County Charter, the Council must adopt a new and balanced spending plan for the County by June 1st. Our Budget Review and Adoption Process includes work through our Council committees, staff reviews and critically important public engagement. Residents are strongly encouraged to participate in public hearings and meetings scheduled to accommodate the public. Budget meeting schedules are subject to change. All Council meetings, including budget sessions, are live-streamed and available via the Council’s website, https://pgccouncil.us , for on-demand viewing. For updated information on the Council budget process, committee work sessions and public hearings, visit the Council’s FY 19 Budget Portal. 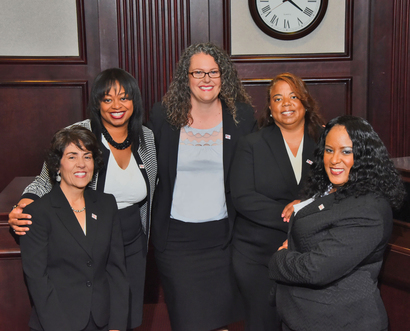 HAPPY WOMEN'S HISTORY MONTH FROM YOUR PRINCE GEORGE'S COUNTY COUNCIL WOMEN! Prince George’s County Council Members were among the attendees at the 33rd Annual Prince George’s County Women’s History Month Luncheon on Thursday, March 15th. The theme “Serving Together Serving All” is especially appropriate as this County Council is majority women and is chaired by a woman! 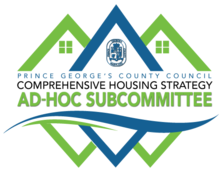 The purpose of the Council's Ad-Hoc Housing Subcommittee is to provide critical and valuable feedback and oversight that can best inform the Comprehensive Housing Strategy to ensure that the plan is truly representative and addresses the needs of the diversity of residents in the County. Council Chair Dannielle Glaros joined with numerous advocates on March 8th, to testify in Annapolis in support of a statewide $15 Minimum Wage. In January, the full Council passed CR-05-2018 to support a statewide $15 Minimum Wage, which will begin to reverse decades of growing pay inequality between the lowest-paid workers and middle class workers. Chair Glaros emphasized Council support for the legislation's provision to support Developmentally Disabled Adult (DDA) care providers. On March 13th, District 5 Council Member Andrea C. Harrison and District 9 Council Member Mel Franklin testified before the Senate Budget and Taxation Committee in support of SB 928 – Prince George’s County – Property Tax Credits – Supermarkets. Their testimony stated that SB 928 is solid enabling legislation that gives the County one more piece in our toolbox to help boost our economy and provide more shopping options for our citizens, especially in areas where it is most needed.